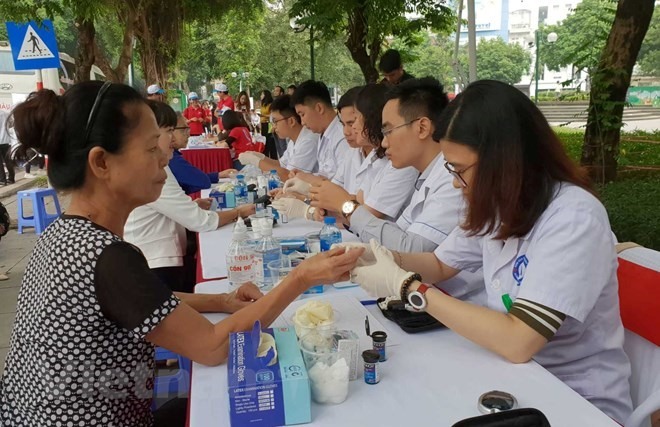 HÀ NỘI — Up to 1,000 residents in Hà Nội at high risk of contracting diabetes participated in a screening, held on Sunday by the Ministry of Health. The event, co-organised by the Việt Nam Young Physician Association and AstraZeneca Việt Nam, aims to mark World Diabetes Day that is annually held on November 14. The event this year was themed “Family actions to prevent diabetes”. Participants were tested for diabetes and received consultations about proper nutrition. Speaking at the event, Minister of Health Nguyễn Thị Kim Tiến said all nations face a rapid increase of non-contagious diseases. Data from the health ministry showed that one out of every 25 adults in Việt Nam had diabetes, she said. Diabetes is the third leading cause of death in the country. Therefore, it was necessary to perform early examinations and screening, the ministry recommended. The number of diabetes patients that have been diagnosed accounts for just 30 per cent of the total. Up to 70 per cent of diabetes patients do not yet know they have the disease, she said. Professor Trần Văn Thuấn, president of the Việt Nam Young Physician Association, said the event was organised to raise public awareness of the impacts of diabetes on individuals, families and the whole society.